Gueuzerie Tilquin | Beer Apprentice - Craft Beer News, Reviews, Interviews and Info. What’s up folks? For today’s craft beer review I’m going to be trying an Oude Gueuze Tilquin à L’Ancienne (2011-2012) produced by Gueuzerie Tilquin located in Rebecq-Rognon, Belgium. I’ve really been in the mood for a nice Sour lately and this beer was recommended at the bottle shop, so I thought I would give it a go. The website, gueuzerietilquin.be, had this little description of the à L’Ancienne. Bierghes installed in the valley of the Seine, the Gueuzerie Tilquin is the only gueuzerie Wallonia. A gueuzerie or Geuzestekerij in Dutch, is a cutting of the old Gueuze (or Oude Geuze ). Freshly brewed musts are purchased from different producers in the region (Pajottenland and Brussels), and put in oak barrels for a period of 1 year, 2 or 3 years. The obtained lambics are blended and bottled to give, after 6 months of fermentation, Gueuze Tilquin the old, which as 6.4% alc / vol and is sold in 75cl bottles and 37.5. The beer came in a 25.4 oz. bottle and the label stated that this one had an ABV of 6.0%. It poured a cloudy, golden/yellow to golden/orange color with a very large, fluffy, soapy, rocky, white head. The retention time was super and the lacing looked decent enough. It fell back into the liquid fairly quickly, but it was patchy and about what I would expect for a brew of this style. The nose began as expected as well. Sour and tart notes of green apple, bits of lemon citrus, green grapes and maybe even a touch of lime. It also had a nice shot of some mustiness, oak and grassy/earthy tones to help counterbalance those sour smelling fruits. I didn’t really find any sort of acidity or vinegar redolence. That was quite alright, but I was positive I would have found that. Oh well, still a very nice bouquet in my opinion. The taste released a solid dose more green apple and green grape than it did in the aroma. It gave a sturdy punch of sourness right off the bat Very “white wine” like. An acidic savor started strong enough, but slowly died down as I worked my way through the bottle. The notes of wood and oak were subtle at the beginning, however they really became more convincing as the beer started to warm and develop. Some grass and earth were found buried deep, which helped round things off a tad. The mouthfeel was medium bodied. Sharp, bitey, crisp and very dry. The carbonation was lively and prickly. No warmth to speak of, but an excellent amount of flavor was left behind for me to enjoy between sips. Overall, I thought this to be an exquisite and exemplary beer. One that I would definitely drink again. It was sour, but not too sour. Oaky, earthy and woody without being too oaky, earthy and woody. The drinkability was fairly high because the sourness was not overpowering and it was harmonized very well with the grassy/earthy tones. It totally hit the spot and helped fix my Sour crave. 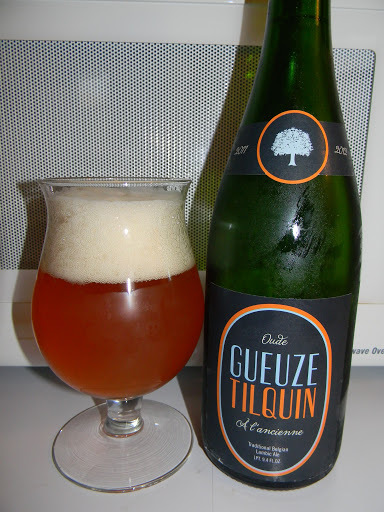 I would definitely recommend that you give the Oude Gueuze Tilquin à L’Ancienne a try if you have the opportunity. I would like to grab another bottle myself and set it aside for an extended period of time to see how it changes. Have you guys ever tried it? What did you think? What vintage did you have? Please feel free to leave a comment below if you’d like. I love to hear a second opinion.